What do you think of my new place to take photos? Is it better than the usual? love this outfit !! the skirt is just amazing ! Love your necklace and sandals! I'm your newest follower dear. Sometimes it's fun to mix & match colors & to work around a pair of shoes. I do that sometimes with shoes I rarely wear! Love your outfit. Thanks for the follow & I'm following back via Bloglovin! Loving the colors you put together and I always feel extra pleased when I can match an entire outfit around my shoes. That print on your skirt is pretty damn awesome too. 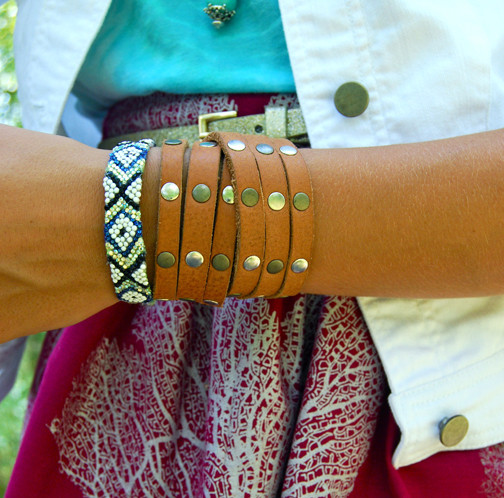 Love the wrap leather bracelet! Great color mix. Those sandals are amazing. The color of your skirt is SO gorgeous!! Cute outfit! wow girl! love the combination and the colors! Very cute sandals and skirt dear! In love with the colors!